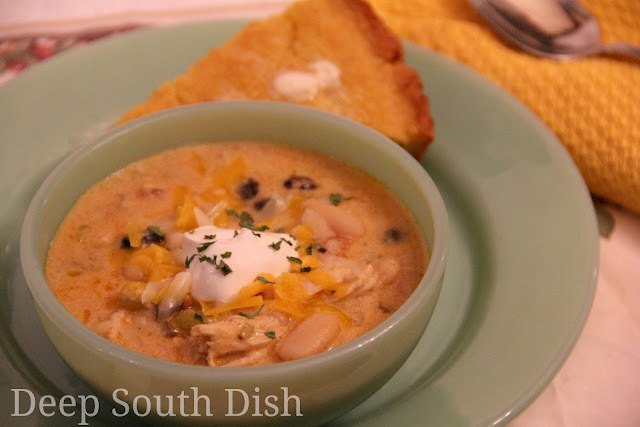 A creamy version of chicken tortilla soup, made with cooked chicken and fajita seasonings. Served with a garnish of crispy tortilla strips, shredded cheese, sour cream and served here with a side of sour cream cornbread. Here's the soup I promised to you on the recent post for the Sour Cream Cornbread. Oh. My. Goodness. Y'all really must try this - I insist! Trisha Yearwood was on The Chew last week and prepared the Chicken Tortilla Soup recipe from her first cookbook, Georgia Cooking in an Oklahoma Kitchen. Y'all already know I have both of her cookbooks, I've tried several of her recipes, and I love her Food Network show, because she and I seem to cook alot alike. I was excited to hear that not only did her show get picked up for another season, but that she shot more episodes than the initial run, and she said, that Garth would be making a few appearances. Yay! I just love her. Besides the fact that if you put a dark haired wig on Trisha, she looks like the identical twin of my sister, and she's a talented musician, you can tell that she is also naturally talented in the kitchen, and not just somebody who wants to ham it up to the camera to boost their ego to become famous... well, besides the fact that she already is famous. What I mean is that she's very naturally authentic with her cooking, so you can tell that she actually spends a lot of time in the kitchen. She's a little bit of a smart aleck too, in a humorous sort of a way, which shows me she's a strong Southern gal who doesn't take stuff off of anybody... if ya know what I mean. I like that, because, well... I'm like that. A Southerners Motto: "Don't ever mistake my silence for ignorance, my calmness for acceptance, or my kindness for weakness." Anyway, I was already in the midst of writing a new recipe for chicken tortilla soup anyway, and we finally got a rainy day, followed by a couple days of lower humidity, plus I absolutely loved the idea of doing a creamy version, so in the kitchen I went to finish my recipe with a few new tips. Oh my goodness y'all... I think you're gonna love this version. Kind of like I am with noodles in chicken soup, I have never been a fan of just dropping corn tortillas into soup either. I prefer them to be crisped up and I usually have a bag of white corn tortilla chips in the house anyway, because that is one of my top snack chips of choice. I also love Kettle brand chips, and Zapp's, but I can finish off a bag of those before I even realize it, so they aren't around here as much. I'm a gal that loves some crunch, and I found for this soup that I liked using the tortilla chips much better than strips of corn tortillas, putting some of them on the bottom to soften, and garnishing with more. You'll see masa harina mentioned in the recipe, which is a form of corn flour. It's made from field corn that has been dried and then soaked in a lime and water solution and ground into a fresh masa dough, that is then dried and powdered. The texture is very light, sort of like cornstarch, and is a traditional flour used for corn tortillas, tamales and in Mexican and Tex-Mex recipes to add a unique flavor. I happened to have some in the pantry already because I make homemade tortillas with it, but don't go and buy a bag if this is the only thing you're going to use it for. While all purpose flour isn't an appropriate substitute for masa harina in certain recipes, we're using it here as a thickener more than anything, so plain flour will serve just fine. This tortilla soup is very adaptable as far as the heat level goes, in case you want to keep it on the milder side for the kids, or punch it up for those spicy loving adults. It is really up to you. For more bite, increase the chili powder, or use a hotter version, like smoked chipotle, bump up the jalapeno, Cajun, cayenne seasoning, and/or use a hotter version of salsa. Add a can of enchilada sauce for a different variation. Nutritional Factoid: Did you know that while most canned beans are very high in sodium, simply by draining and rinsing them, you will get rid of nearly half of the sodium level? And, just so you know, it also helps to reduce some of those gas-causing sugars too. I've separated the ingredients by steps - so don't be daunted by the list of ingredients. It's really a very simple recipe! Here's how to make it. For more of my favorite soup recipes, visit my page on Pinterest! Combine the seasoning mix; set aside. For the base, melt the butter in a soup pot over medium heat and add the onion, cooking until softened about 4 minutes. Add the minced garlic and cook another minute. Add the masa harina or flour and the seasoning mix; cook and stir for 2 minutes. Slowly add in the chicken broth until fully incorporated. Stir in the evaporated milk, half and half and cream soup, bring mixture up to a boil. Add the salsa, beans, corn, green chilies and jalapeno; return to a boil, reduce heat to medium low, and let simmer for 15 minutes. While the soup is cooking, prep the garnishes. Stir in the cooked chicken and heat through, another 5 to 10 minutes; taste and adjust seasonings. Crumble tortilla chips in individual soup bowls and ladle soup over the top. Garnish with more crumbled tortilla chips, add a pinch of both cheeses, and a dollop of sour cream and finish with fresh chopped cilantro, and other garnishes, if desired. Cook's Notes: I used a can of white kidney beans (cannellini) along with the black beans. Okay to substitute a package of fajita seasoning - just omit the first section of seasonings. This soup gets better after a day or two so it's a great one to make ahead and go ahead and double it if you're feeding a crowd. For the chicken I used 4 boneless, skinless chicken breasts that I roasted. Drizzle chicken with olive oil, season with salt and pepper and bake on a foil lined baking sheet at 400 degrees F for 20 to 30 minutes, or until cooked through. Let cool and chop or shred. Time will depend on size of chicken breasts. Chicken Enchilada Soup Variation: Add in one (10 ounce) can of enchilada sauce or an equal amount of homemade. My Word, my foodies are killing me with their scrumptious posts this morning. I LOVE taco soup while I didn't click to confirm, I suspect I've made your 7 can taco soup many times! The recipe I make for tortilla soup, I use torn apart corn tortilla shells added to my broth (they disolve) and thickens and adds a wonderful taste! Great tip K! Are those leftover shells that have been cooked already, or just straight out of the package? just straight out of the package! I'm gonna try that! Much better than the raw strips. Great tip - thanks!! I've never tried a creamy version of it! Oh my gosh Pam, it is SO good! I think you might be right and you know, I have a feeling you're gonna love it! Oh yum that is a perfect match for the cornbread! Yum! So glad everybody enjoyed it!! Can I do this in the crockpot?? I'm not sure, but if you make a few adjustments it might work. Just can't guarantee it! On the stovetop, this soup cooks in under 30 minutes, and since cream and milk products do tend to separate and curdle with long cooking, if I were to experiment with this for the crockpot, I'd prepare the soup as a plain tortilla soup and wait to add the milk and cream toward the end and crank it up to high to heat it faster. I still don't think it'd be able to go more than a few hours on cook time even on low though, since you're using already cooked chicken. You could change that to raw chicken to go a little longer. Dark meat would give you the most freedom with cooking time. 6 hours on low would be as far as I'd push it with raw chicken, much shorter with already cooked. Hope that helps! I laughed when I read the recipe calling for "Slap Ya Mama" seasoning. A friend went to Louisiana years ago and brought me back 3 containers of that stuff. I still have some!!! They do not sell it in Virginia as far as I can tell. Man, that stuff is delicious. So funny! Love that stuff Michele - it really is good! Amazing recipe; we've made it at least 10 times now. I was curious though, do you have any idea what the nutritional info per serving is? I do not, but I know that there are some calculators available online to work out recipes. Since this is just a collection of my own personal recipes and not a diet site or a large corporate site, I leave that up to individuals to calculate if they wish to.